This decadent Praline Frosting spread or drizzled onto these Homemade Fudgy Brownies make for delicious and ultra-rich Praline-Iced Brownies, but don’t stop there, it’s delicious with Apple cake, Spice Cake, Carrot Cake and so many more baked treats. Use my homemade brownie recipe as a base, or if you’re in a quick fix mode, turn your box mix into a homemade treat just by adding this Praline frosting. 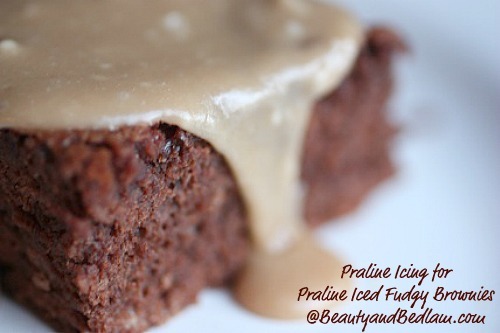 Summary: This homemade Praline Frosting turns any brownie into sheer mouthwatering decadence. Prepare Fudgy Brownies as directed. In 2 quart saucepan, heat 5 tablespoons butter or margarine. Add 1/3 cup packed brown sugar over medium-low heat until mixture has melted and bubbles, about 5 minutes. Remove from heat. With wire whisk, beat in 3 tablespoons bourbon OR 1 tablespoon vanilla extra plus 2 tablespoons water. Stir in 2 cups confectioners’ sugar until smooth. Spread topping over room temperature brownies. You added pecans to be optional but it should be perfect when its always there and a must, altering pecans with other nuts can be optional.